An after school program is held once per month at Barton Road to provide interesting, fun and community building activities for school aged girls and boys. Program is developed by Barton Road Committee Chairs and supervised by Service League members at each meeting date. Healthy snacks are also provided by Service League members for the program. 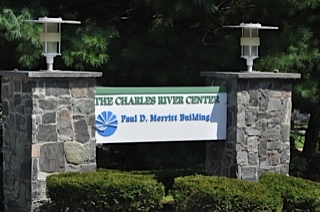 Charles River Center is a non-profit social service agency providing advocacy and services to people with disabilities. Service League members work with clients in a variety of activities that focus on life skills once per week on location. Charles River Center offers day habilitation services for people with disabilities. Wellesley Service League volunteers provide extensive help three days per week in the creative arts and music programs enhancing the experience of the clients. Wellesley Service League members work with the Ellie Fund and Dream Dinners to deliver meals to cancer patients within the Boston area. 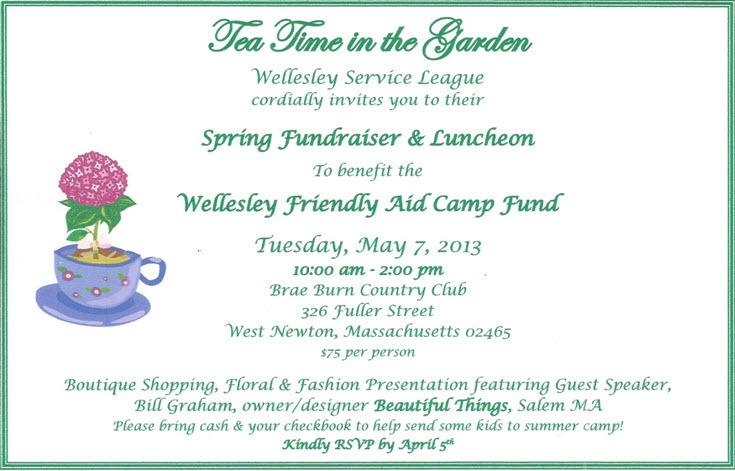 The Wellesley Service League sponsors one fundraising event each year to benefit the Wellesley Friendly Aid Camp Fund. Every summer dozens of children who otherwise would not have the opportunity to attend camp are awarded this experience thanks to the Wellesley Service League as primary sponsor, along with other civic organizations and donors. Nearly fifty years old, the Camp Fund is managed by Wellesley Friendly Aid. Service League members, with the direction of the Fundraiser Committee Chairs, organize, plan, and coordinate the annual event. Our members participate in monthly meetings for senior men to enjoy informational programs, lunches and other activities. 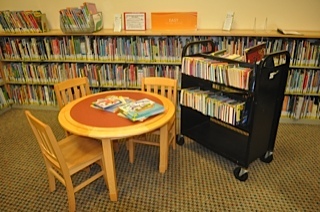 Wellesley Service League members volunteer about ten hours per week to shelve library books, mainly in the Children’s Room. Wellesley Service League members have been active at the Newton-Wellesley Hospital since the 1940s. 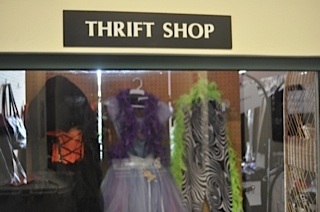 Today, members assist Thrift Shop staff with sorting, tagging, and selling merchandise in the shop to raise funds for the Newton-Wellesley Hospital Auxiliary. Service League members support the Food Pantry twice a week by participating in weekly food pickups at local grocers, sorting and stocking food at the Food Pantry and making deliveries to recipient families. Wellesley Service League members participate as guest ushers during the Wellesley Symphony concert season. 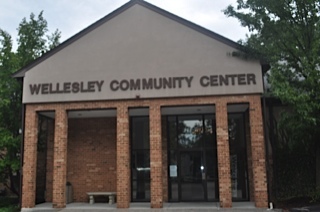 During the flu season, Wellesley Service League members assist at flu clinics taking place in Wellesley. In the spring, members assist the Health Department with the Wellesley Wonderful Weekend dog contest. The Tolles-Parson Center offers weekday lunch service for seniors. Wellesley Service League members volunteer at the lunch service one day per week. 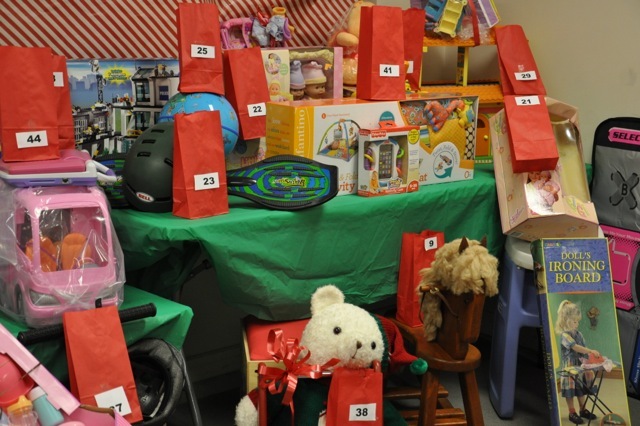 Our Toy Shop is a three month endeavor which includes toy collection, toy cleaning and packaging for distribution, and a two day toy shop for families supported by Wellesley Friendly Aid. In cooperation with Wellesley Friendly Aid, our members participate in weekly social meetings for senior woman to enjoy companionship, programs, excursions and other enjoyable activities. 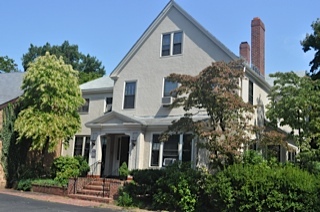 All food and transportation is arranged and provided by Wellesley Service League members. 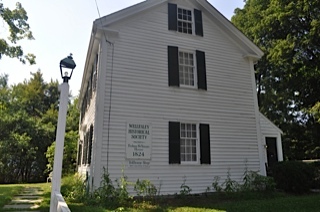 Wellesley Service League members volunteer once a week in the Toll House Shop, located in the Wellesley Historical Society House, and help sell gently used donated items.